Now before we begin, I do admit this is not a question many people have asked themselves! Most people that visit us at freshairguide are more concerned with finding the best air purifier to remove mold – but nevertheless, I thought I’d include this on our blog as it’s quite simply fascinating. In our previous blog post about the different colors of mold we talked a little about Yellow mold and it’s slimy nature. Frequently encountered in gardens throughout the world, these gooey organisms love to make their homes on wet and decaying wood and plant matter. In Mexico, some people even consider the gelatinous mass as something of a delicacy. Thankfully they don’t just eat it raw, that would be too disgusting. No…they fry it up like an omelette – mmm, delicious! 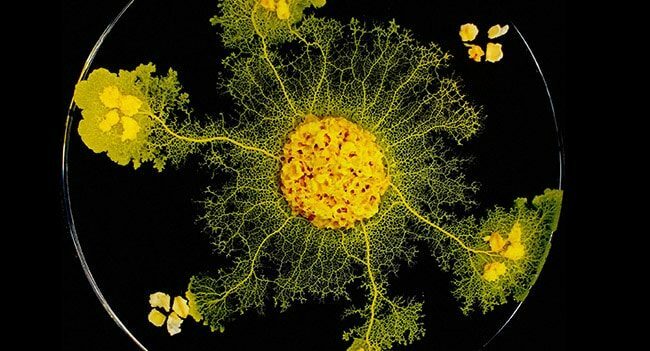 Slime mold is not just different in appearance to all other molds, but it’s genetic makeup is completely different too. It does not have a brain, however it can still solve a complex maze. Maze solving mold is a fairly recent discovery which has led many researchers on the quest to work out exactly how it’s doing it. The director of the MBL Physiology course – Dr Wallace Marshall has recently included Physarum polycephalum (otherwise known as slime mold) research to the curriculum in 2017. He acknowledges that there’s a fair amount of proof on the internet that yellow mold can genuinely achieve this feat – but that there hasn’t been an awful lot of scientific research into what is going on at a cellular level, and perhaps more interestingly… what else this mold is capable of doing. Sadly the mold doesn’t attempt to solve these mazes as it’s bored and looking for something to do! It needs encouragement and like we often see in nature, that encouragement is food. The maze works like this. Place the slime mold at one end and a food source at the only possible exit to the maze. One of the fun experiments you can do with slime mold is to see just how far away you can put the food source (how large of a maze) before the yellow mold doesn’t attempt to go for it. Scientists are still attempting to work out how the Physarum detects the food in the first place. Once the test begins, the slime mold moves quite quickly and will branch out into every possible avenue until it finds the end of the maze. When it locates the food, it then retracts all the branches that got stuck in dead ends – leaving behind just the one single trail that found the finish line. An interesting discovery about this process is that on the branches it retracts, it leaves behind a think layer of slime which acts a signal to tell the mold not to bother going that way again as it’s a dead end. Dr Marshall believes the Physarum uses a crude form of measurement to confirm which branch has succeeded before it begins the retractment of the other, failing branches. There are many questions left to answer about the slime mold makeup as biologists even admit that many slime molds get classified as protists – which is essentially a taxonomic group reserved for molds that they don’t fully understand. So, without further ado, I will leave you with a video of slime mold solving a maze and let you marvel at this unique, and fairly disgusting organism doing what it does best.